In-home drug testing provides peace of mind. Protect the health and safety of your family discreetly. In-Home Drug Testing strives to provide parents with accurate and affordable drug test kits. As a Drug Free Network partner, our in-home drug tests are extremely reliable. Drug Free Network offers parents and guardians a comprehensive program of education and more importantly support in implementing in-home drug testing on their children ages 10-18. We give parents a step by step program manual on how to introduce this program to their children, supply the parents with the appropriate testing supplies and offer one on one consultation. Our program is meant to be used as a means to “prevent and deter” drug use in our youth. The in-home drug testing kits let parents know if their child is using drugs before a school or law enforcement officer has the opportunity to notify the parent. This will prevent your child from doing something to harm themselves or others before it is too late! We offer a 10 panel urine drug test which detects the 10 most abused drugs and the parents read the results in 5 minutes. We also offer a saliva based alcohol swab test and nicotine test that shows results in 2 minutes. We also assist parents in finding counseling or treatment facilities the child or family may need. We believe this program gives children another motivation to say “no” when being offered drugs because their parent has access to in-home drug tests. They can tell their friends “no way, if I test positive I will lose driving privileges, curfew time, and cell phone time” etc. The child will know the consequences up front before the chance to experimenting arises! 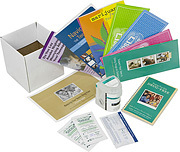 Learn more about our in-home drug testing kits and about Drug Free Network. Feel free to contact us for additional information about home drug test kits and their application. Thank you for visiting In-Home Drug Testing. Check back soon as we continue to add additional resources about home drug testing.